The new Brimbank Park (Parks Victoria) play-space will inspire and capture the imagination of people of all ages and all abilities. 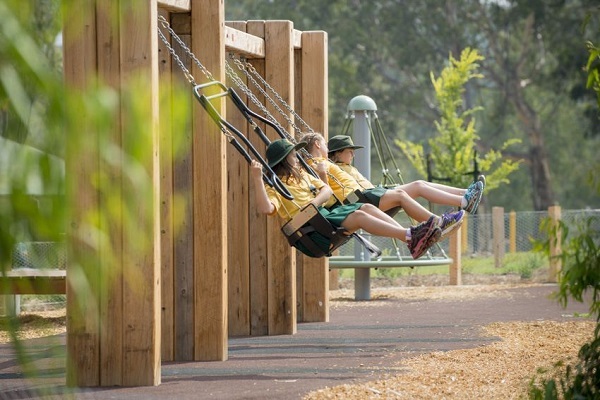 The playground was designed by Ric Mcconaghy (who also designed Wombat Bend) who has created a space for creative play that children and carers will love exploring. 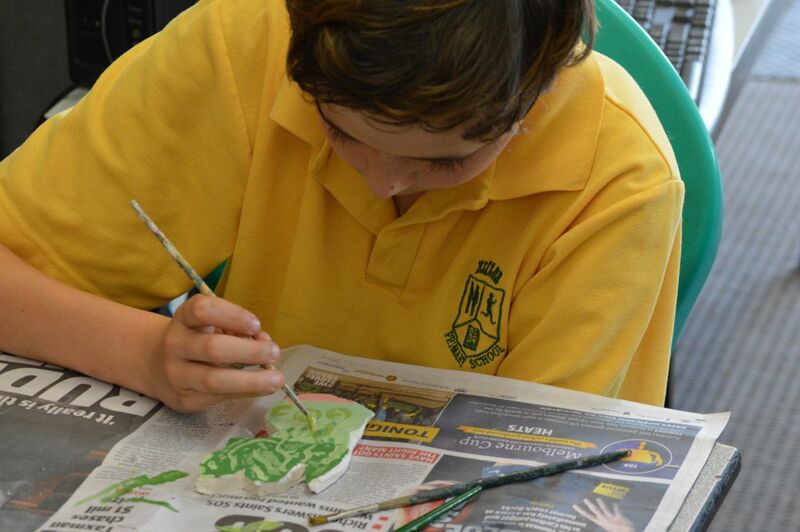 I was involved in creating the ceramic tiles for the park and worked with most of the students at Keilor Primary School as well other community members. The play-space is situated deep within this beautiful park, surrounded by rolling hills, a volcanic landscape and river. It opened in February 2014 so is still very new; it will take a little time for plants to grow and enhance the natural beauty of this wonderful place. 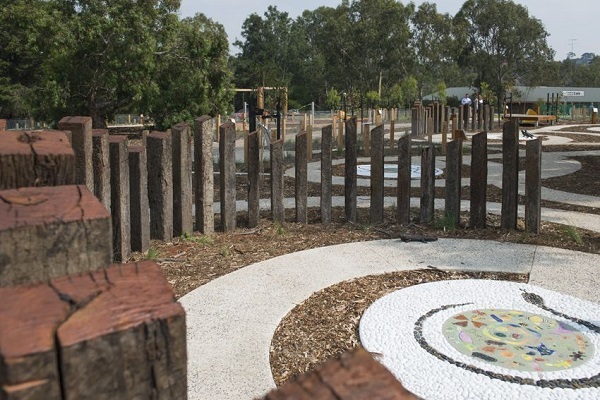 The Brimbank Park playspace includes seven circles featuring hand-made tiles. Each tells a story relevant to the park and its history. They are surrounded by pebble mosaics by Crafted Landscapes; a large wall and a map of hand miles tiles is nearby. An eagle’s nest, as well as gorgeous bronze sculptures, giant vegies and animals, and a huge platypus are other features. Bunjil is a powerful and important figure for Australia’s Indigenous people – particularly those around Melbourne and Geriwerd (The Grampians). As part of our design process, the Grade Five-Six students were shown a moving video of the story told by Joy Murphy-Wandin as well as some footage of the wonderful Bunjil’s wings at Museum Victoria. The story of Bunjil inspired the Grade Five-Six students to think about their environment and care of it. In this panel, you see Bunjil flying over some of his creations. Waa – the Crow, also known as Waa The Messenger and Waa the Destroyer. We found lots of variations of the story of Waa, another important figure in Australian Aboriginal mythology and chose to focus on this version below. One child who knew the story contributed more detail which found its way into our art work. “In the Dreamtime fire been a jealously-guarded secret of the sevenKaratgurk women who lived by the Yarra River where Melbourne now stands. These women carried live coals on the ends of their digging sticks, allowing them to cook yams. One day Crow found a cooked yam and, finding it tastier than the raw vegetables he had been eating, decided he would cook his food from then on. However, the Karatgurk women refused to share their fire with him and Crow resolved to trick them into giving it up. Crow caught and hid a number of snakes in an ant mound then called the women over, telling them that he had discovered ant larvae were far more tasty than yams. The women began digging, angering the snakes, which attacked. Shrieking, the sisters struck the snakes with their digging sticks, hitting them with such force that the live coals flew off. Crow, who had been waiting for this, gathered the coals up and hid them in a kangaroo skin bag. The women soon discovered the theft and chased him, but the bird simply flew out of their reach and perched at the top of a high tree. Bunjil the Eaglehawk, who had seen all of this, asked Crow for some of the coals so that he could cook a possum. Crow instead offered to cook it for him. Soon, a large group had gathered around Crow’s tree, shouting and demanding that he share the secret of fire with them. The din frightened Crow and at last he flung several live coals at the crowd. Kurok-goru the fire-tailed finch picked up some of the coals and hid them behind his back, which is why to this day firefinches have red tails. The rest were gathered up by Bunjil’s shaman helpers, Djurt-djurt the Nankeen Kestrel and Thara the quail hawk. This panel reflects the natural beauty of the local river environment. Brimbank Park was once a farm. It was known from its tomato production. The children drew their ideas, cut them out and arranged them in a variety of ways into a circle to work out our final design. Although it was tricky at first for the children, it was a process that enabled them to consider the design carefully, for example, is there a top and a bottom? what if people approach from one direction – can they see the design? how can we cluster images to make the design more interesting? Nearby the play-space is a cafe and many people also enjoy a picnic at Brimbank Park. This panel celebrates celebrating! Cakes, ice-cream, chips and no-one was all that interested in my suggestions of healthy food!! 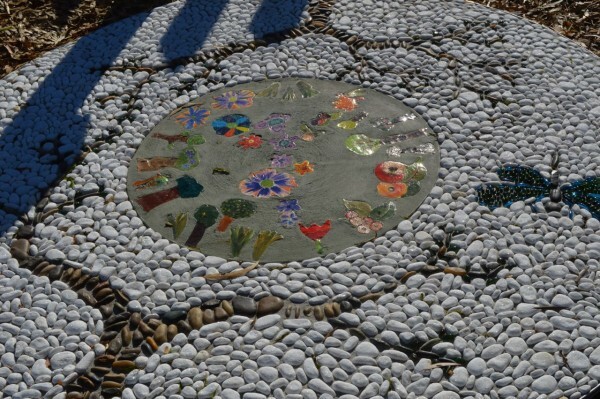 The large tiles created by me depict the various features of the playspace; the pathways are made up of 100s of animal and bird footprints created by the younger children at the school. I was often surprised and delighted by their exclamations that making the tiles ” is so RELAXING!” There were many skills for the preps/grade ones to learn – such as rolling and cutting the tiles and painting. Some of the older children helped out with this too. 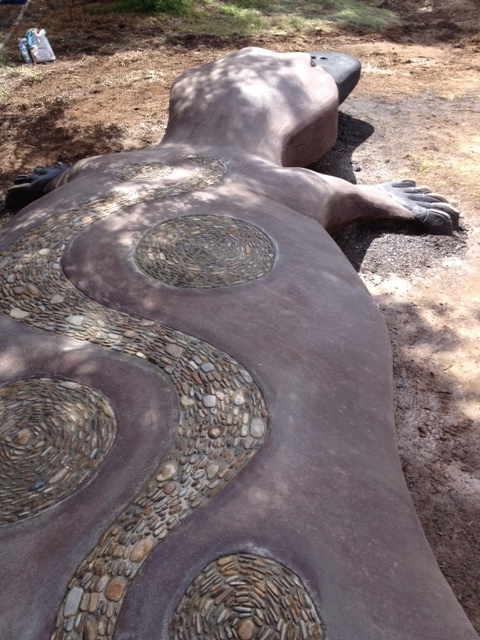 An eight metre wall behind Bunjil’s nest features many tiles depicting the stories of Bunjil and Waa, as well as portrays the animal and bird life of the park and region. We had a deadline to meet as the park was scheduled to open in February; by December school was finishing up and I was heading to Nepal – so I enlisted the help of some talented and arty children in our neighbourhood as well as my sister and niece who were visiting from the UK. We had great fun painting the tiles together. When I was feeling a little pushed to get the job done before our departure my sister lightened my mood with her creation – the bird with the teeth! Tile making is relaxing, as the children say. All the tiles were installed by Ric and the team at Crafted Landscape as I was by then in Nepal. They worked in the hottest week of January/February and did an excellent job. I was absolutely thrilled to see the work that had been so carefully and loving made installed with equal care. from Parks Victoria – about the opening. Member for Western Metropolitan Bernie Finn MLC recently opened a new $1 million playscape at Brimbank Park in Keilor East. Mr Finn joined local children from Keilor Primary School whose art works have been installed in the playscape, to celebrate the official opening. “It’s wonderful to see how this beautiful area has been transformed into such an innovative and creative play space for children of all abilities and their families,” he said. “This space will no doubt be a popular drawcard for families in the Western suburbs and those beyond for many generations. “The playscape has been designed especially to create opportunities for children of all abilities, including those in wheelchairs, and their families to connect with nature and to play, explore and socialise in the outdoors,” he said. “Research tells us that getting out into nature is important for children’s physical, emotional and cognitive development. “Playscapes such as this enable our kids to explore, experience unstructured play and develop a sense of freedom and independence, as well as gaining the healthy benefits of physical exercise and social interaction. 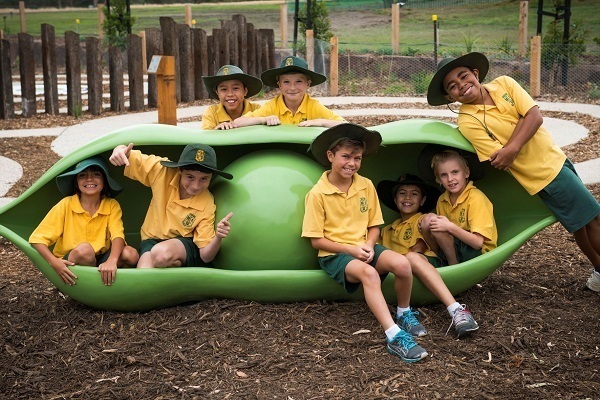 Mr Finn said the new facility’s features include a giant Bunjil nest for children to climb, beautiful sculptures, a maze with many elements to discover, and a ‘build-your-own’ cubby house structure. “I’d like to congratulate all involved in this project, including Parks Victoria staff, the design team which includes Ric McConaghy in partnership with ACLA landscape architects and Warrandale Industries, the construction consultants, for developing such an innovative playscape that will delight children for many generations. “I also acknowledge the Wurundjeri Elders for their generous sharing of stories and culture to help develop this playscape. “This space is an exciting addition to Brimbank Park, which is also a popular place for walking, picnicking and exploring along the Maribyrnong River,” said Mr Finn. 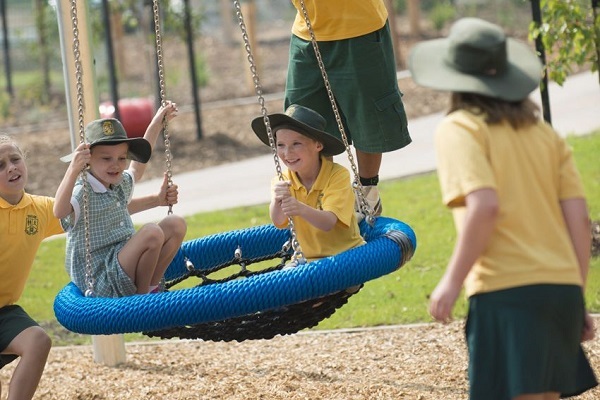 Variety – the Children’s Charity CEO Holly Reid said, “Variety is thrilled to partner on the Brimbank Park playscape to create a space of all inclusive play for children of all abilities”. The project was funded by the Victorian Government, in partnership with Variety the Children’s Charity, the People and Parks Foundation and John T Reid Charitable Trusts. This entry was posted in 2013, 2014, ART IN PUBLIC SPACES and tagged Aboriginal mythology, All abilities play spaces, Anne Riggs, Art and Play, Artists in Community International, Brimbank Park, Bunjil the Eagle, Children and art, Clay, community art, Crafted Landscapes, Creative play, creative spaces, Hand made tiles, Keilor Primary School, Parks Victoria, Play Australia, Play spaces, Ric McConaghy, Waa the Crow, Wombat Bend Park. Bookmark the permalink.